Nestle into the gentle embrace of quality, plush wool covers! The SnugFleece Original is simply the most superior virgin wool cover in the industry. Wool has an inherent ability to act as a natural thermostat. It is unique in the way it handles temperature and moisture, adjusting throughout the night to accommodate your fluctuating body temperature. Heaters and electric pads just can't do that! Wool covers are exceptional on waterbeds too. 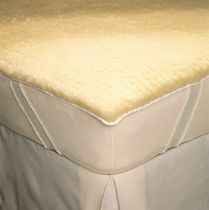 By absorbing excess moisture, they prevent that clammy feeling commonly associated with waterbeds.